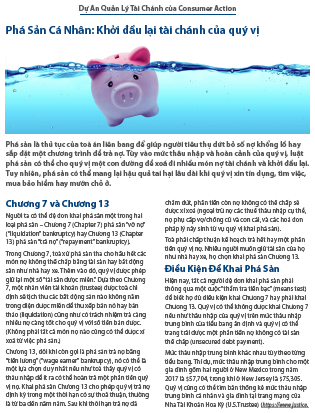 Library: Vietnamese | Personal bankruptcy: Your financial fresh start (Vietnamese) . Library: Vietnamese | Saving Your Home from Foreclosure (2009) (Vietnamese) . Library: Vietnamese | Keeping Your Home - Protect your investment (Vietnamese) . Library: Vietnamese | Disaster Relief Resources (Vietnamese) . This free fact sheet is designed to help you assist homeowners in your community to access benefits and protections to help them save their homes from default and foreclosure. The resources listed in this fact sheet are legitimate statewide or national programs available to disaster-impacted homeowners at low or no cost.